Rainbow Six Siege is escaping rainy old Blighty in favour of warmer climes for its fourth season this year. 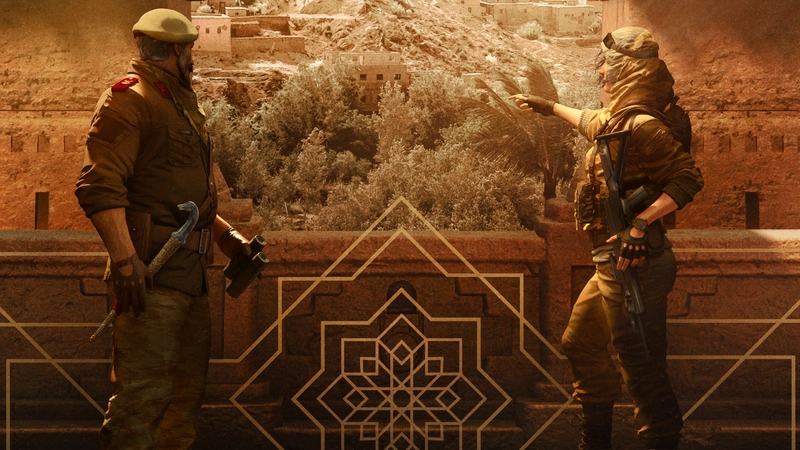 Operation Wind Bastion is taking the tactical game of window abuse to the Kingdom Of Morocco, and into a very scenic old fort out in the mountains. This update will also introduce the usual duo of new operators, this time taken from the ranks of the GIGR (Groupe d’Intervention de La Gendarmerie Royale), a Moroccan special forces unit. Below, we try to pick a little meat from the bones of this pointedly vague announcement. The two new Operators coming are – once more – a defender and attacker pair. The new defender is commander of the mountain fort himself, described as “as stoic as the mountains are immovable”. So, a grumpy old git, then. Beyond that, there’s not much to glean from his official description. The other is a famed lady explorer, “an expert on environmental operations with a knack for pushing the enemy back”. Quite what that means is anyone’s guess, but I’m going to assume she shoots people. Let’s zoom and enhance and see if we can’t pick out anything else. Well… I’ve got nothing. Sadly, unlike the previous operation, zooming in on the new characters doesn’t tell us much about them. The new defender on the left looks respectably grizzled. Classy beret, a dense grey beard, a pair of binoculars in hand and what appears to be an ornate, sheathed blade at his side. Beyond that, not much. The new attacker isn’t giving up any secrets through her appearance either. She has what looks like a fairly standard assault rifle, but no other gear of note is visible. Ubisoft, how do you expect us to wildly speculate based on this? In all seriousness, Morocco seems like a good next stop, and a world away from the rainy dreariness of the updated Hereford Base. It’s also nice that this’ll be a whole new map, instead of a rework of an existing one. The kasbah’s sheer, high walls and wide open brick-lined window-spaces should make for some interesting gunfights where cover is more than just visually obscuring. Ubisoft mention “unprecedented roof access” in their official announcement, so I can see this being a more vertically arranged environment than most. Plus, no skeletons to cover up, I assume. Ubisoft will be showing off Operation Wind Bastion on November 17th and 18th, during the Pro League Finals on Twitch here.